Explanation: Is that ice under the Phoenix spacecraft on Mars? Quite possibly. Phoenix, which landed a week ago, was expected to dig under the Martian soil to search for ice, but the lander's braking jets may already have uncovered some during descent. Pictured above is an image taken last week by the Robotic Arm Camera showing the unusual light-colored substance just in front of Phoenix's landing pad. 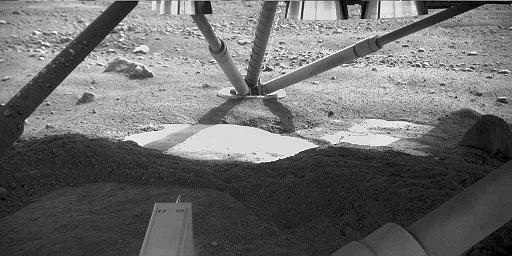 Over the next few weeks, Phoenix will continue to photograph its surroundings, analyze the composition of this hard light substrate, and dig into the surrounding soil. Were the unusual light substrate indeed Martian ice, it would give Phoenix a convenient pedestal to investigate the history of water on Mars, and to better determine whether the boundary between ice and soil was ever capable of supporting life.